February 1 2012 the entire parliamentary group of The Movement of the Icelandic Parliament nominated Private Bradley Manning for the Nobel Peace Prize. Following is the reasoning we sent to the committee explaining why we felt compelled to nominate Private Bradley Manning for this important recognition of an individual effort to have an impact for peace in our world. We have the great honor of nominating Private First Class Bradley Manning for the 2012 Nobel Peace Prize. Manning is a soldier in the United States army who stands accused of releasing hundreds of thousands of documents to the whistleblower website WikiLeaks. The leaked documents pointed to a long history of corruption, war crimes, and imperialism by the United States government in international dealings. These revelations have fueled democratic uprising around the world, including a democratic revolution in Tunisia. According to journalists, his alleged actions helped motivate the democratic Arab Spring movements, shed light on secret corporate influence on our foreign policies, and most recently contributed to the Obama Administration agreeing to withdraw all U.S.troops from the occupation in Iraq. Bradley Manning has been incarcerated for well over a year by the U.S. government without a trial. He spent over ten months of that time period in solitary confinement, conditions which experts worldwide have criticized as torturous. Juan Mendez, the United Nations’ Special Rapporteur on Torture and Cruel, Inhuman and Degrading Treatment or Punishment, has repeatedly requested and been denied a private meeting with Manning to assess his conditions. The documents made public by WikiLeaks should never have been kept from public scrutiny. The revelations – including video documentation of an incident in which American soldiers gunned down Reuters journalists in Iraq – have helped to fuel a worldwide discussion about America’s overseas engagements, civilian casualties of war, imperialistic manipulations, and rules of engagement. 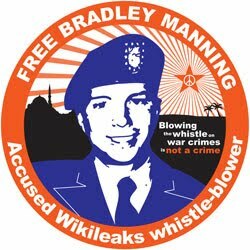 Citizens worldwide owe a great debt to the WikiLeaks whistleblower for shedding light on these issues, and so I urge the Committee to award this prestigious prize to accused whistleblower Bradley Manning.